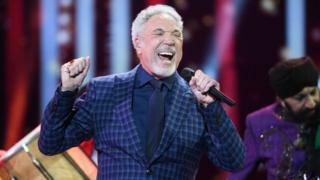 Sir Tom Jones has apologised to fans after he was forced to cancel a number of shows due to an infection. The 78-year-old singer and judge on the TV show The Voice UK took to Twitter to thank fans who supported him and apologised "for the shows that didn't happen" last month. He was forced to miss five dates when he was admitted to hospital to treat a bacterial infection. A sixth show from his summer tour was also cancelled due to a thunderstorm. The singer's cancelled shows were throughout July in Hampshire, York, Chester, Leicestershire, Germany and Finland. Sir Tom tweeted: "Many thanks to all who came out for our show this summer. We all had a wonderful time onstage, sharing great music, fantastic vibes, enjoying the long summer glow. "Apologies again for the shows that didn't happen, but hope to see you all soon next time, next place. Lots of love." His summer tour continued after he recovered, and he has performed in Turkey, Jordan, Germany and the UK since his illness. Sir Tom offered full refunds to fans who missed shows and performed at a rescheduled show at Chester Racecourse on Sunday. "I'm not doing the show"